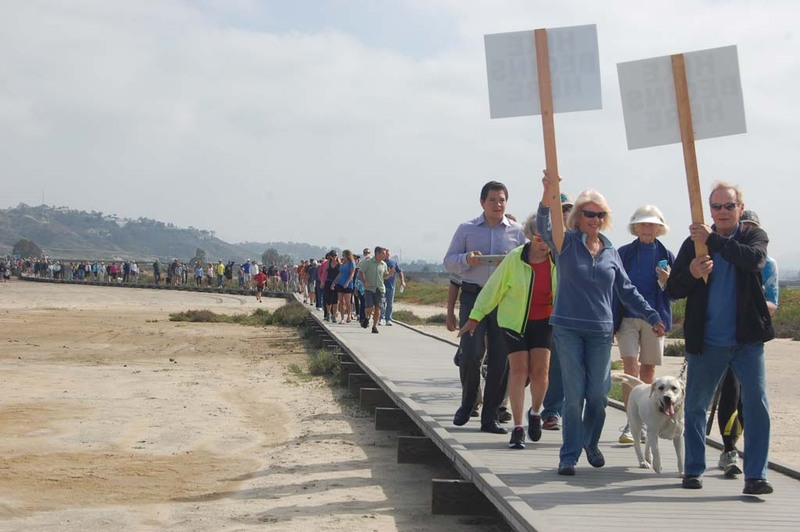 DEL MAR — Efforts to keep a popular boardwalk that runs along the San Dieguito River have at least partially paid off. The San Dieguito River Park Joint Powers Authority board of directors voted 7-0 on April 8 to accept a compromise negotiated with the California Coastal Commission to remove about 680 feet of the eastern portion of the structure. In exchange, the remaining 520 feet will remain in place and end in a viewing platform. “No one was happy that the much-loved boardwalk will now end with a viewing platform, but the decision was based on preserving public access to the restored wetlands and allowing the more extensive excavation and tidal flow desired by the Coastal Commission and staff,” JPA Chairman and Del Mar City Councilman Don Mosier said. The 1,200-foot walkway was built in 2007 by volunteers at a cost of about $354,000. The money came from private donations and San Dieguito River Valley Coastal Conservancy and transportation grants. It is considered an educational and recreational resource that gives river park visitors an up-close look at the San Dieguito Lagoon. The development permit from the Coastal Commission identifies it as interim. Staff members from that state agency sought to have it moved as part of an ongoing wetlands restoration project of an overflow parking lot used by the Del Mar Fairgrounds. Supporters, including officials from Del Mar, Solana Beach, the 22nd District Agricultural Association, which governs the fairgrounds, and at least one county supervisor dispute most of their claims. The JPA tried to get the interim designation removed. But at the March 11 Coastal Commission meeting the vote was 5-5, which meant the request was denied. The JPA board later voted to resubmit its application because the commission said mitigation for the one-acre loss of wetlands was not addressed. The request for a new hearing was due April 11. At a March 21 rally to save the boardwalk, Trish Boaz, executive director of the River Valley Conservancy, said ideas for mitigation were being negotiated. The commission’s standard ratio for wetlands mitigation is 4:1, which in a worst-case scenario meant the JPA would have to fund 4 acres of wetlands restoration elsewhere at a cost of about $1 million, Zito said. “All of these deals are very fluid, and when you have different elements going on concurrently, at one point a plan of action or strategy comes to the front that has more traction than another,” Boaz said. “Because of the risk of going back to the commission and potentially being turned down again and risking the entire boardwalk having to be removed, this compromise was put together. “Either you go for everything and lose everything or you try for everything but you get this compromise, which still provides for a good nature-viewing experience for the public, although they won’t be able to go from one side to the other of the boardwalk,” she added. “The restoration plan for the south overflow lot includes construction of a new portion of the Coast-to-Crest trail along the northern perimeter of the project, so the through access formerly provided by the boardwalk will be replaced by this new trail,” Mosier said. Coastal Commission and JPA staff members met April 6 with representatives from the conservancy and the 22nd DAA to work out the compromise, which was presented to and approved by the JPA board two days later. As part of the deal another 280 feet of the dirt trail at the east end of the boardwalk will also be removed. The JPA will receive mitigation credit for wetlands impacts for the removal of the eastern portion of the boardwalk. Plaques honoring donors who supported the boardwalk construction will be relocated to the remaining western portion. The city of Del Mar has expressed interest in repurposing some of the planks for a proposed river path extension project or a potential future connection of the river path up to Crest Canyon, Joseph Smith, Del Mar’s associate planner, said. The 22nd DAA is responsible for paying for the partial removal. A cost estimate is not currently available. “It’s not the outcome that we were hoping for, but it’s 500 to 600 feet more than we had yesterday,” Boaz said. “It’ll still be able to be enjoyed by people, and we’ll be able to use it for educational programs, so that’s all positive. “To think that the other alternative was for it to be removed altogether wasn’t acceptable,” she added. Boaz said she believes the Save the Boardwalk rally and “hype by the supporters, the boardwalk brigade,” made a huge impact.